Thought I’d blow some of the dust off the blog. I’ve been busy, lately. What with learning the ropes of a new job and generally keeping myself occupied with real life, I’ve made a discovery. Life, when there are no immediate problems to vent about, is the most boring thing in the world to blog about. About the most exciting thing of late… I had to fork out an inordinate number of pennies to get my kitchen roof repaired though; that was depressing. It was my planned holidays-for-the-year money that I’ve been carefully saving up – like a good girl. It was snatched out of my piggy bank and dropped into the pocket of the roofers. Admittedly, in turn, they did stop the persistent leak in the kitchen, so at least I can be grateful for that. And the roof looks much less like people chucked a pile of slate up there and just let it lie where it landed. So you know. Practical and aesthetic. A holiday would be nice, though. I’m mostly done with writing the second adventure for Gilrain, whose first outing was in the Tales of the Nun and Dragon anthology. That boy is a sheer pleasure to write for, because… because he’s utterly hopeless. But he’s eternally optimistic and there’s something oddly infectious about it. The style is loose and easy; very light-hearted and lets me stretch my comedy muscles a little. I’m a sucker for bad puns (I have that in common with Dan Abnett and Piers Anthony) and writing for Gilrain lets me use all sorts. The short story I wrote for the Black Library Chapbook last year – Reaper – (known at the time as ‘Operation: Handbags at Dawn’) is also now available as a digital short story. It’s a dirty story of a dirty man, and his clinging wife doesn’t understand… well, sort of. It’s the last moments of an unfortunate Empire soldier who, in his death throes, is tried and judged by the consort of the Blood God. I additionally got a little spotlight moment on the Black Library blog today as well, so that was nice. I’ve been reading more than usual of late; have read Deceived, Fatal Alliance and Revan, all set in the Star Wars: The Old Republic universe. I’ve enjoyed all three of them for different reasons. 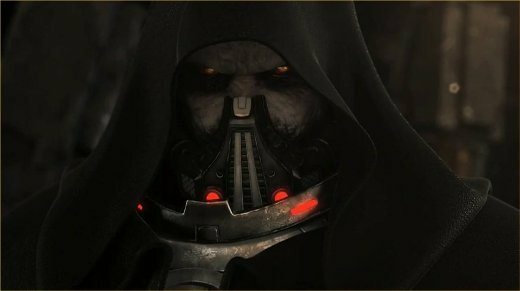 But Deceived in particular was enjoyable because of Darth Malgus. I have a gamer-girl crush on Darth Malgus. It’s the voice. It’s certainly not the looks. That dratted Mr. Kemp. DRAT HIM. This is the moment all fathers of daughters everywhere dread. SW:TOR has gobbled up most of my evenings, really. I utterly love it for everything it has to offer. The levelling is great, the storylines are amazing (I just finished the Imperial Agent storyline and it’s my favourite so far) and the roleplay is brilliantly creative given certain limitations. I had the utter delight of meeting a bunch of guildies a couple of weeks ago at a SW:TOR event down in London. It was a great day out and already I miss them. In short, life ticks on. And that’s good, ‘cos it’s not bad. This entry was posted in General, Reading, Writing and tagged life, SW:TOR, Writing. That’s so funny… I popped in here this afternoon to the whooshing of tumbleweed, and now look! I have real, honest to goodness super-powers! But I always knew that. Also, because of the way the background works, I just noticed Darth Malgus looks like he’s holding a balloon. Awesome.